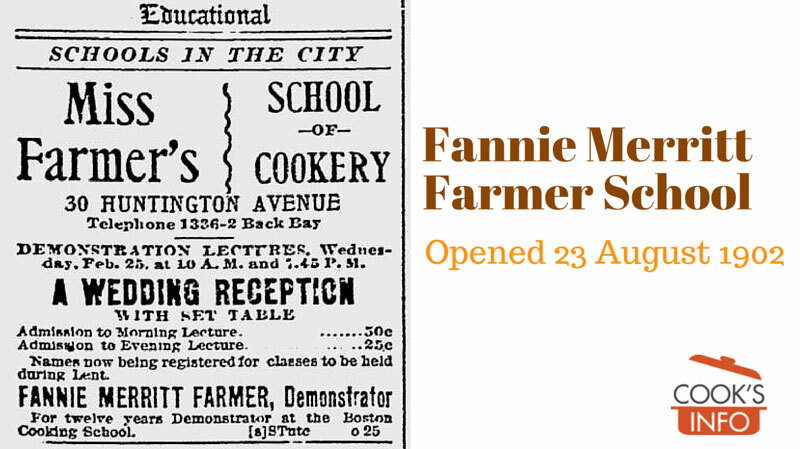 Fannie Merritt Farmer (1857–1915) opened her famous Boston cooking school on this date, 23 August, in 1902. Fannie managed the Boston Cooking School from 1891 to 1902. She then opened her own school, the Miss Farmer’s School of Cookery, in order to reach a different type of student. The target market for the Boston Cooking School was teaching people how to become teachers and teach cooking, at her new school, she aimed to teach people who would actually be doing the cooking — housewives and nurses. The new school opened on 23 August 1902; it was located at 30 Huntington Avenue in Boston, Massachusetts, USA. Her summer courses were 5 weeks; they involved two sessions a day from Monday to Friday, covering Practical Dietetics (two sessions), Infant and Child Feeding (two sessions), Applied Organic Chemistry (four sessions), Invalid Cookery (two sessions), Feeding in Institutions (four sessions), Duties of a Waitress (eight sessions), Sewing (two sessions a week), Marketing Course (four sessions), and Advanced Cookery (twenty-four sessions.) Others teaching at the school included a Dr Elliot P. Joseph, Dr Charles W. Townsend, , a Mrs C.E. Pearce, and Alice Bradley (1875-1946). During the year, Fannie gave lessons during the day for housewives, and during the evenings for nurses and professional cooks who had to work during the day. In 1915, upon Fannie’s death, Alice Bradley purchased the school from Fannie’s sister Cora, and became principal of the school. She wrote a recipe book sponsored by the General Electric Company in 1928, called “Electric Refrigerator Menus and Recipes.” In 1903, the school became associated with Simmons College, which had opened on 9 October 1902. In 1903, Simmons College leased space at 372 Boylston Street in Boston which had formerly housed laboratories for the Boston Cooking School and which was merged into the College in 1902. In 1944, Alice retired, and sold the school to a Dr. Dana Wallace. The school was still in business as of 1945.